Every year Elliott Masie’s Learning organization recognizes 30 individuals under the age of 30 for their leadership accomplishments in learning field. Recently FIU Online Senior Instructional Designer, Erika Huezo, earned “30 under 30” recognition for 2018. After she became aware of the “30 under 30” program, she reached out to Masie to learn more about the program. An application process followed where learning professionals interested in the program can apply and share their experiences, goals, and hopes for the future of the learning field. She felt her initiative to network with Maisie, in addition to her various professional accomplishments earned her the recognition. Part of the “30 under 30” program included professional development sessions. It also afforded personalized time with leaders of various organizations. During the conference, she shared that many learning leaders spoke to the importance of relationships in their careers. She stated this resonated with her as the support of her own peers and supervisors are valuable to her. 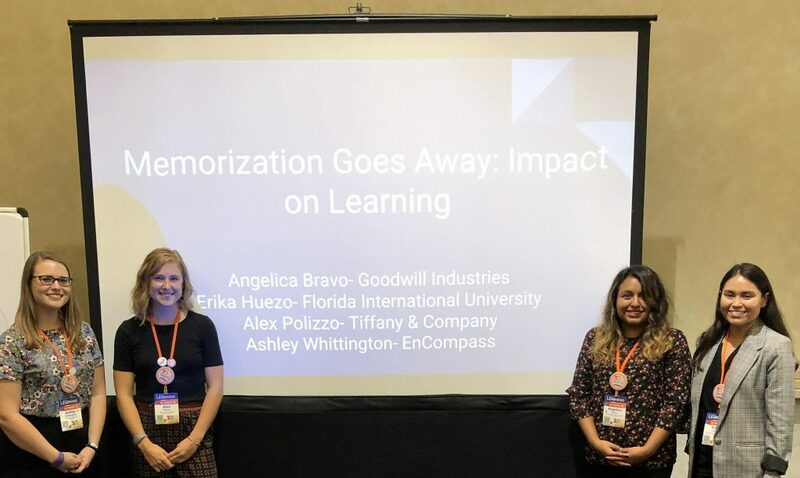 FIU Online Instructional Designer, Erika Huezo, presented with others “Memorization Goes Away: Impact on Learning” at the Learning 2018 conference. Erika was invited to attend the Learning 2018 conference and present with other “30 under 30” winners. She co-presented a session, “Memorization Goes Away: Impact on Learning.” During the presentation, attendees examined challenges in trying to find information in the moment of need and shared practices that helped them in the past. Additionally, ideas for what the future could look like were discussed. She also participated in a reverse-mentoring sessions, where learning professionals asked attendees question. Some of the questions included were related to engaging employees in her age group and challenges when working with different generations.